The KCEA provides us as Kungarakan people and descendants of Alyandabu (Lucy McGinness), an organisational structure through which we can come together to conduct the cultural affairs of our family group. If you are a descendant of Alyandabu, please fill out a membership form (on request). We would love to hear from you. Our membership comprises the descendants of this extraordinary individual, a woman before her time in many respects. 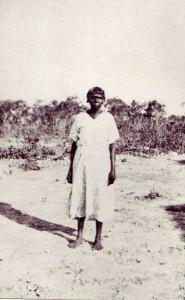 Singer songwriter Teg Egan describes Alyandabu as ‘around six feet tall (183 cm), straight as a gun barrel, black, proud, barefooted, wearing a simple cotton frock and a wide-brimmed stockman’s hat. In her hand she carried a few items tied in a red handkerchief, and she puffed contentedly on a pipe as she walked’. Alyandabu was and remains a tribal matriarch and succeeded by our mothers and aunties in the role as our Almeyuk (senior woman). 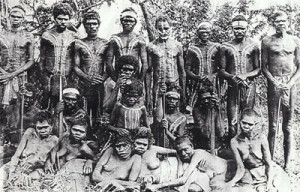 Her brother Maranda can be seen at the very right if this tribal group in this photo of our ancestors. The descendants of Lucy Alyandabu and Steven McGinness are now too numerous to count but still identify proudly with their strong heritage. Their children Bernard, John (Jack), Margaret, Valentine and Joseph McGinness inherited many of their talents amongst those a love of music and an inherent gift for engineering something out of nothing. They took their place in the 1930s fighting for Indigenous rights and leading the way for their own children and grandchildren to become leaders and professionals in their own right. Mickey Dewar, ‘ Alngindabu [Lucy McGinness] (1874? – 1961)’, Australian Dictionary of Biography, Volume 13, Melbourne University Press, 1993, p. 39.